At 6 inches, can we really class this as a smartphone? If you love big phones and battery life is a priority, the Mate could be for you. Otherwise, we'd stick to the brands you know for now. Huawei is the epitome of the challenger brand. With a brand name that no one ever pronounces correctly (even a receptionist at the Mate's launch event reffered to the company as 'highway'), the Ascend Mate isn't going to be on the tips of the tongues of many in the market for a new phone. To counter this, Huawei is resorting to headline-grabbing specs and features. There's the 6.1-inch screen, for starters, plus a custom quad-core processor which Huawei is claiming to be fastest in the world. Has we got your attention yet? With a screen this size, the Ascend Mate truly is a 'phablet', however much you may hate that word. It is more than a centimetre taller than the Samsung Galaxy Note 2, and half of a a centimetre wider. It is also a touch heavier, at 198-grams, though for better perspective, compare this to the 130-gram weight of the Galaxy S4. In short: this feels like a big phone to hold and carry around. Happily, the quality of the 6.1-inch screen makes it feel like the size and weight are a worthwhile trade-off. 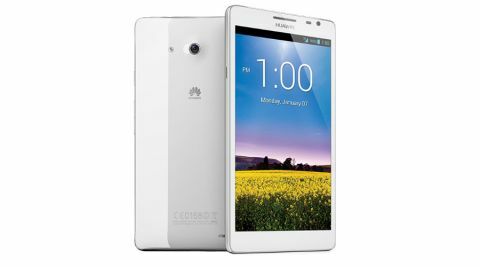 Huawei opts for a bright IPS LCD display which shows excellent colours and blacks, and has a fantastic viewing angle. Even with the phone titled at acute angles away from your eyes, the images on screen as still clear and colourful. Huawei positions the power and volume buttons halfway down the side of the handset, and while this might seem unusual at a glance, it is actually the best place for them for when you are holding the phone one handed and hoping to find the buttons easily. There are no hard or soft navigation keys on the handset itself. Instead, Huawei make use of the soft-keys included in the design of the Android Jelly Bean, with Back, Home and Multitasking buttons along the button of the visible screen space. There is a 3.5mm headphone socket on the top of the handset, across from a micro-SIM slot. There's also a microSD card slot on the side to expand the handset's 8GB internal storage. The back of the phone is covered in a soft-touch black plastic, which feels nice to hold, even though it shows fingerprints over time. In what may be considered an unpopular move, the Ascend Mate is a sealed handset, meaning you won't have access to the battery.